There are so many versions of video’s from IZ’s songs that have been uploaded to YouTube. To avoid confusion to what is the Official video of his songs, we are continuing to upload these Official Videos to our new YouTube channel. I really wish I could have met this man….what an awesome soul he was with a voice of an angel. All I can say is he and his music is absolutely Beautiful! My first remix for another artist! 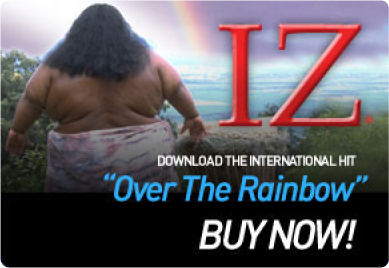 I’m deeply honored to present my official remix of the platinum hit Over The Rainbow by Israel “IZ” Kamakawiwo’ole. We miss u and we love you IZ! I decided to give out this unmastered virgin track as a gift because I believe in my heart that the world needs as much of IZ’s sweet voice as possible right now.